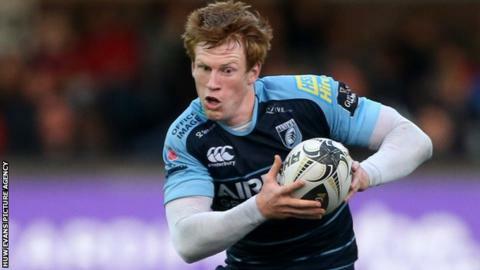 Rhys Patchell has been signed from Cardiff Blues to play as a fly-half rather than full-back, says Scarlets head coach Wayne Pivac. Patchell, 22, will join the Scarlets on a two-year contract from the Blues at the end of the current season after turning down a new Blues deal. Pivac told BBC Radio Wales Patchell is not guaranteed a starting place. "He knows what we have here and we've told him we want him as a 10 and that's what he wanted to hear I think." Gareth Anscombe's arrival at the Blues in July 2014 from Waikato Chiefs in New Zealand saw Patchell move to full-back to accommodate the newcomer. "It's a position (fly-half) we've been looking at at great length since the departure of Rhys Priestland," Pivac continued. "We have a position there which we haven't been totally happy with. Not any one of the 10s have really nailed it this year. "There's still a long part of the season to go and they'll get opportunities, but Rhys will certainly add to the mix in the backline." Patchell will join Wales centre Jonathan Davies at Scarlets next season after Davies' switch from Clermont Auvergne. And Pivac says the Scarlets are still hoping to strengthen further ahead of next season, adding: "We're very pleased with the signings to date. "We haven't finished recruiting and we're still looking, but I won't tell you which positions at this stage." The region are also eager to retain the services of Wales scrum-half Gareth Davies. "We're keen for Gareth Davies to stay and we're in talks with him at the moment," added the New Zealander. Scarlets are currently top of the Pro12 table with 34 points from their first nine games.